Jozef Maximilián Petzval (born Jan. 6 1807 in Szepesbéla (Spišska Belá), former Hungarian Komitat Zips in Slovakia, died Sept. 19 1891 in Vienna) got his engineering diploma at the University of Pest in 1828. He spoke several languages. In 1832 he made a doctorate at the philosophical faculty after further studies in mathematics and physics, becoming a professor of Higher Mathematics in 1835. From 1837 to 1877 he was tenured professor of mathematics at the University of Vienna. In 1840 he designed and calculated the first fast lens for photography. Voigtländer made the first of these lenses in May 1840 - the lens for Voigtländer's Daguerreotyp-Apparat zum Portraitiren. His lens design became a standard lens for portraiture, renowned as Petzval lens. Because of growing mistrust against Peter Wilhelm Friedrich von Voigtländer, Petzval sought other partners for making his lens designs. Petzval designed a second type of lens, the Orthoscope, a doublet with a smaller aperture than the portrait lens, but a larger area of sharp focus - intended for landscape and architecture photography. The Austrian opticians Franz Xaver Waibl and Carl Dietzler were the new partners. This lens, made by Dietzler, was patented by Petzval and Dietzler in 1857, under the title Photographischen Dialyten (Orthoscope). Dietzler called the new design Dialyt. Voigtländer made Petzval's nightmares true by copying the patented lens, renaming the lens type to Orthoskop. That infamy was one of the reasons for Dietzel's bankruptcy. And the related wrangle between Voigtländer and Petzval led to the move of Voigtländer from Vienna (Austria) to Braunschweig (Germany) in 1866. In later life, Petzval continued to study optics, particularly refraction, until around 1859, when some of his optics manuscripts were destroyed in a burglary, he turned to the science of acoustics - and finished his long-running series of lectures on dioptrics in 1862. Petval retired his professorship on his seventieth birthday. 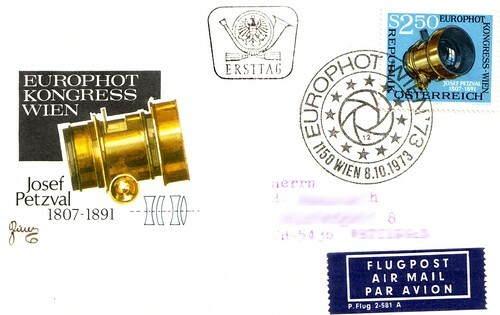 first day cover for Austrian stamp "Europhot Congress Vienna 1973"
This page was last edited on 19 August 2017, at 09:29.